Researchers believe they now know why the supersonic trans-Atlantic Concorde aircraft went the way of the dodo -- it hit an evolutionary cul-de-sac. In a new study, Adrian Bejan, professor of mechanical engineering and materials science at Duke University, shows that a law of physics he penned more than two decades ago helps explain the evolution of passenger airplanes from the small, propeller-driven DC-3s of yore to today's behemoth Boeing 787s. The analysis also provides insights into how aerospace companies can develop successful future designs. The Concorde, alas, was too far from the curve of these good designs, Bejan says. 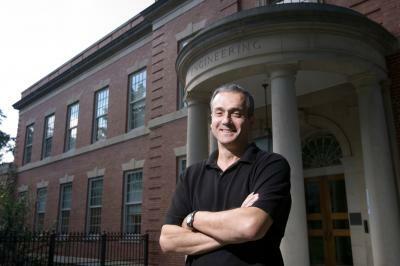 The paper appears online July 22, in the Journal of Applied Physics. "The evolution of Earth's species occurred on a timescale far too large for humans to witness," said Bejan. "But the evolution of our use of technology and airplanes to transport people and goods has taken place in little more than a single lifetime, making it visible to those who look. Evolution is a universal phenomenon encompassing technology, river basins and animal design alike, and it is rooted in physics as the constructal law." The constructal law was developed by Bejan in 1996 and states that for a system to survive, it must evolve to increase its access to flow. For example, the human vascular system has evolved to provide blood access to flow through a network of a few large arteries and many small capillaries. River systems, tree branches and modern highway and road networks show the same forces at work, he says. In the case of commercial aircraft, designs have evolved to allow more people and goods to flow across the face of Earth. Constructal law has also dictated the main design features needed for aircraft to succeed; the engine mass has remained proportional to the body size, the wing size has been tied to the fuselage length, and the fuel load has grown in step with the total weight. "The same design features can be seen in any large land animal," said Bejan. "Larger animals have longer lifespans and travel farther distances, just as passenger airplanes have been designed to do. For example, the ratio of the engine to aircraft size is analogous to the ratio of a large animal's total body size to its heart, lungs and muscles." To apply his theories to airplane design, Bejan teamed up with Jordan Charles, a researcher and development engineer, and Sylvie Lorente, a professor of civil engineering at the University of Toulouse, to mine the historical databases of successful commercial aircraft. As they plotted thousands of statistics including year of introduction, size, cruising speed, engine weight, fuel weight, range, wingspan and fuselage length, many patterns began to emerge. But two in particular stood out. In one chart, a clear curve tracks the increasing size of commercial airplanes through nearly a century of aviation. As time moves on, new commercial airliners come in all sizes but the biggest are joined by even bigger models. 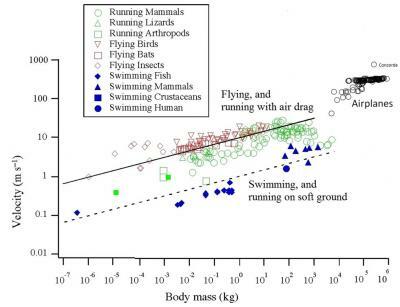 In another chart, the line that best tracks the relationship of body mass to airplane speeds is nearly identical to mass and speed statistics from various mammals, lizards, birds, insects and more. Evolutionary constraints found in nature, in other words, can be seen at work in the airline industry. There was, however, one outlier on the chart -- the Concorde. "The Concorde was too far off from the ratios that evolution has produced in passenger jets," explained Bejan, who points out that the doomed aircraft had limited passenger capacity, a low mass-to-velocity ratio, an off-the-charts fuselage-to-wingspan ratio, massive engines and poor fuel economy. "It would have had to adhere to the constructal design rules to succeed." 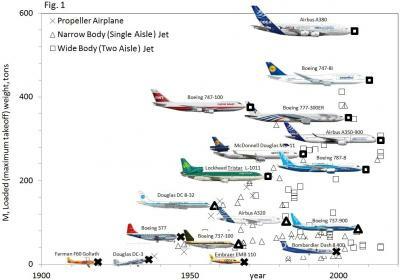 Bejan said this analysis shows that the aviation industry has done well with its designs over the decades, and that the trends dominating the industry are indeed the most efficient. They also reveal the general design parameters that future passenger aircraft should follow to succeed economically. "This study gives the rough sketch of what airplane designs will put you in the game," said Bejan. "For design companies, it is money in the bank." Jose Camberos, research aerospace engineer and lead of design space exploration at the Multidisciplinary Science & Technology Center of the Air Force Research Laboratory at Wright-Patterson Air Force Base in Dayton, Ohio, said that the work will hopefully give the field better insight into where the design of airplanes is going. "There is definitely an analogy to be understood and articulated to explain why engines and airplanes are sized the way they currently are and how that has evolved," said Camberos, who was not involved with this study. "By looking at the development of aircraft in a larger context in these terms, it may be possible to gain insights into how best to achieve what nature has been able to accomplish already."